YOU might well have forgotten the Turkish lira crisis because of the US/China trade war. 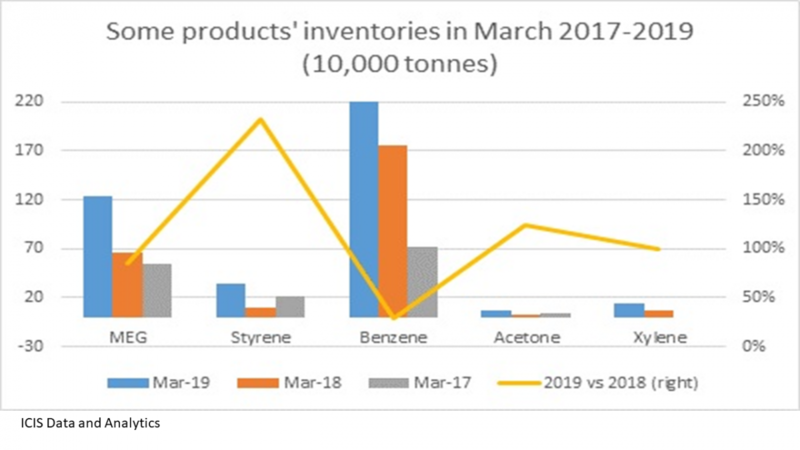 But Turkey is crucial for the health of the global polyolefins business because of the size of its imports. 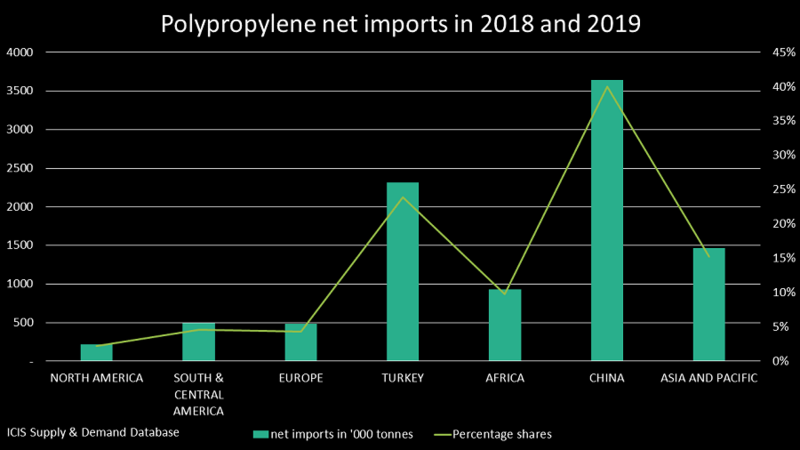 In the case of polypropylene (PP), as the chart at the beginning of this blog post shows, we had expected Turkey to account for 24% of global net imports in 2018-2019, with the country importing 4.5m tonnes. This would have made Turkey the second biggest PP importer behind of course China in first place at 40% and 7.5m tonnes. It now seems likely we will have to revise-down our estimates for Turkey imports, at least for 2018 and possibly for 2019. This would be especially bad for PE given that the US might well find itself almost totally excluded from the Chinese market because of the US/China trade war. Don’t assume just high-density PE and linear-low density PE will be affected because these are the only grades affected by the 25% import duties. 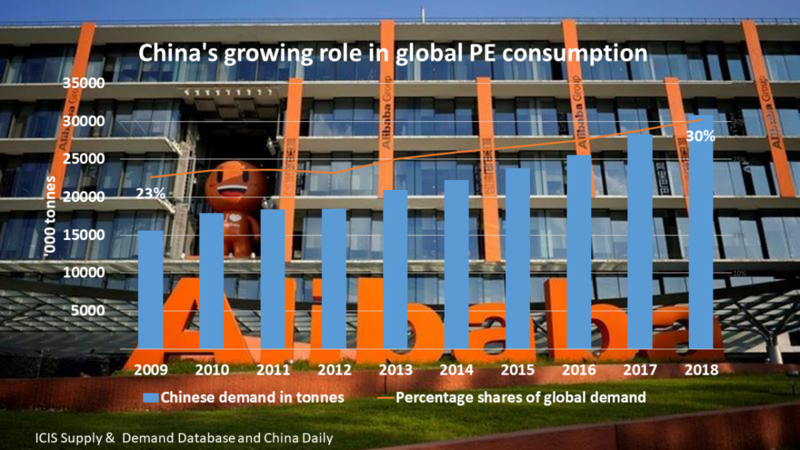 US low-density PE cargoes may also struggle to find a home in China for patriotic reasons. Big increases in US production could end up flooding smaller markets outside China just as demand from Turkey falls below expectations. We also have to consider the impact on the countries that are heavily dependent on exports to Turkey. Saudi Arabia’s PE exports to Turkey in 2017 amounted to around 4% of Saudi Arabia’s total production in that same year, according to the ICIS Supply & Demand Database. This rose to 11% for PP. But Saudi producers have big global sales networks and so should be able to shift lost volumes to other countries. China is obvious destination to fill the gap created by the exclusion of US cargoes. Don’t forget that it is only US PE that is subject to a 25% Chinese import tariffs. 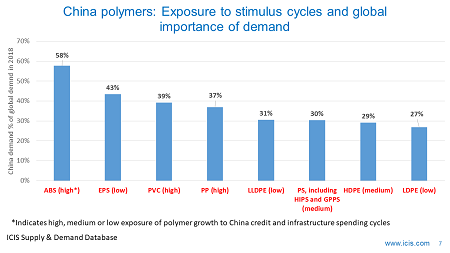 Homo-polymer grades of PP also face the same tariff. The same ability to switch to other markets applies to two other countries that were heavily dependent on exports to Turkey in 2017 – Singapore and South Korea. What about some of the other exporters to Turkey, though, who may lack global sales networks? You can imagine a scenario where their displaced volumes end up being distressed and in the hands of traders. 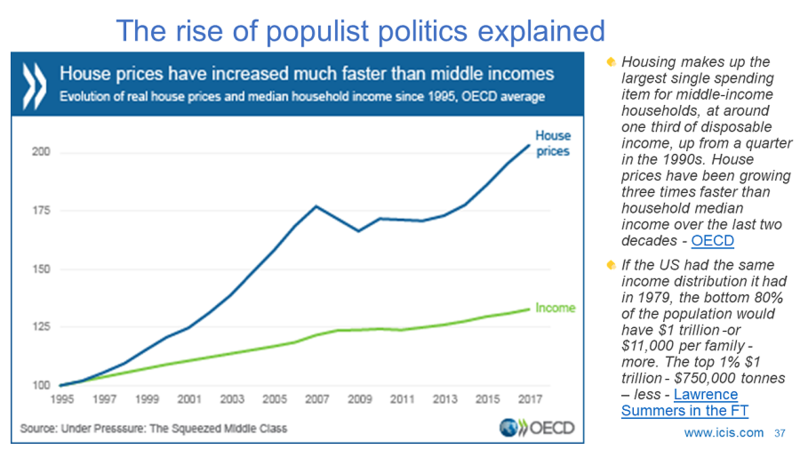 You must also be prepared for the risk that Turkey represents a “canary in the coalmine” – an early indicator of much wider problems. Almost 90% of loans to Turkish real estate companies are in US dollars. Real estate has accounted for 20% of economic growth since 2009. European banks are the most exposed to Turkish defaults with banks in Spain, France and Italy the most exposed. This could then trigger a run on the currencies of other emerging markets with large dollar debts including India, Indonesia, Pakistan, Argentina and South Africa. Countries in sub-Saharan Africa may come after that followed by Chile, Poland and Hungary that have foreign debts in excess of 50% of GDP. Why this binge on US dollar debt? It is the search for yield by investors in response to record-low interest rates and huge quantitative easing programmes following the Global Financial Crisis. But the Fed is now tightening, the crisis in Turkey hasn’t been resolved and the US/China trade war looks as if it will drag on and on. Global dollar-denominated debts have nearly doubled to $11.4 trillion since 2009 with emerging markets accounting for $3.7 trillion of the increase, according to the Bank for International Settlements. $2.5 trillion of emerging market dollar debt needs to be serviced by end-2019. The developing world was in a similarly bad situation in 2009. But it was bailed out by, as I said, lots of cheap dollar debt and by China’s huge economic stimulus programme. China will almost certainly not have the financial muscle to repeat this rescue act as firstly, it faces the negative economic impact of the trade war with the US. 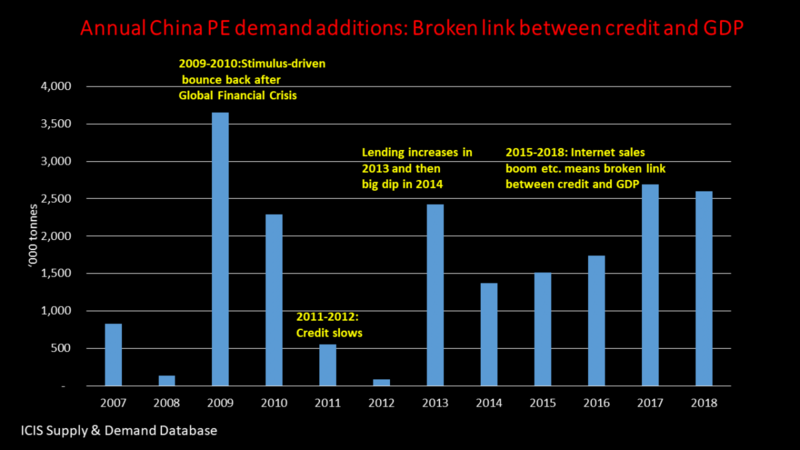 Secondly, China is focused on debt reduction rather than adding to debt through major economic stimulus. That might be your response if you are sitting in the US where stock markets continue to break record highs. But healthy US stock markets whilst the developing world has the problems outlined above cannot possibly equal a healthy global polyolefins industry. 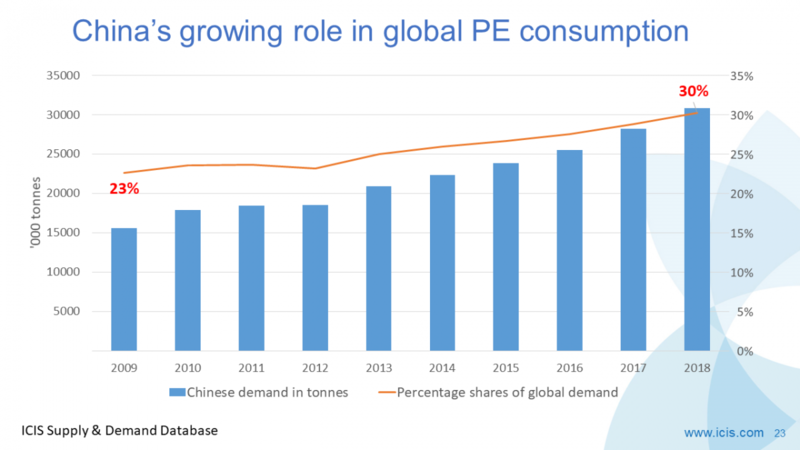 In PE, 84% of growth in 2018-2019 demand will come from the developing world (South & Central America, Africa, the Middle East, China and Asia & Pacific, which includes India, the rest of south Asia and Southeast Asia). “But what about total consumption?” you might ask. 61% of total consumption will again come from the developing world. 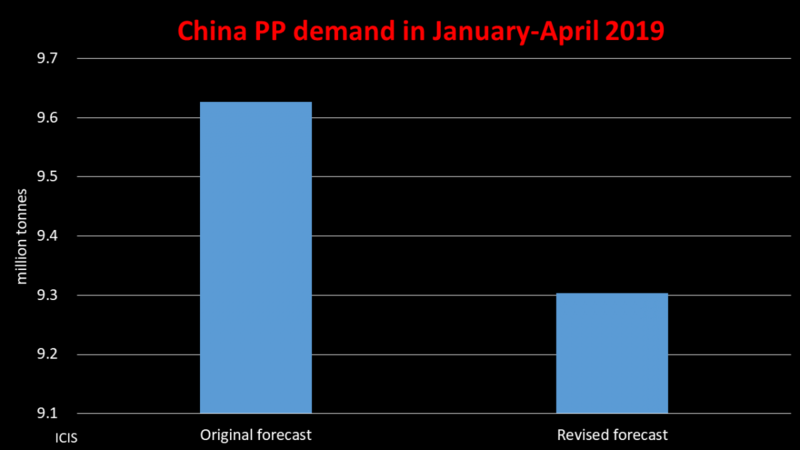 81% of the growth in PP consumption will be generated by the developing world during those two same years. 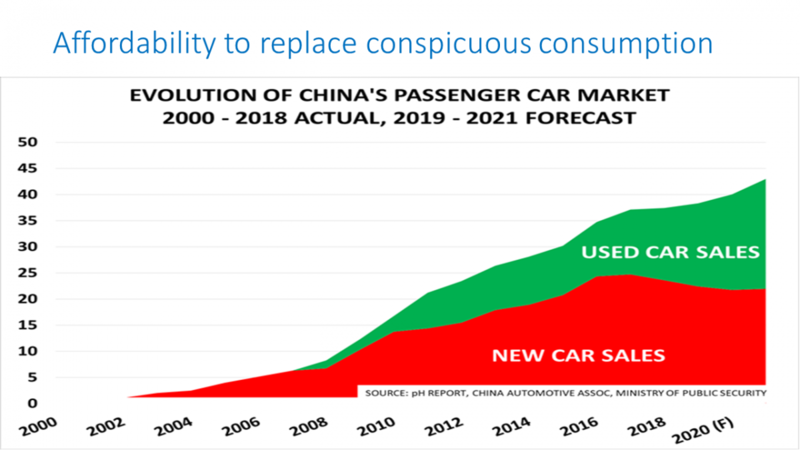 Meanwhile, emerging markets will be responsible for 67% of total consumption. We all hope that these problems will go away. But hope is not a strategy.